Sir Nicholas Harold Lloyd Ridley. Across the world, there are many hundreds of millions of victims of cataracts or of the dreaded African scourge of “river disease” who now have good reason to sing this man’s praises. However, few know his name. 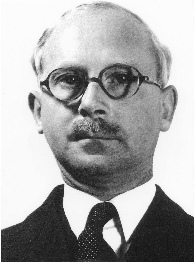 A 1940’s photograph of Harold Ridley, with permission from The Royal Society. Figure 2b from Biogr. Mems Fell. R.Soc. 2007 53, 285-307.
wondrous colours of Nature. This marvellous transformation in my life prompted me to know more of the genius who had revitalised my eyes. To my amazement, I learnt that he was among the all-time medical greats and that his thinking extended far beyond treating the eye. As a direct result of his pioneering researches, he introduced the use of television in the operating theatre and he transformed the ethos of the English medical establishment.In 1951, he infuriated the leading surgeons when he read his Paper describing his new cataract operation to the delegates attending the annual Oxford Ophthalmology Congress. They were horrified to be told that he had inserted into an eye an artefact utilising a medically inert man-made material. In those days it was a surgeon’s job to remove things from the body: not to force bits of plastic or metal into the body. So, Ridley was derided and sent into professional and social purdah for over twenty five years. Incidentally, the story behind his discovery of the material he used to make his implant is riveting because it was the direct result of his time caring for RAF pilots shot down during the Battle of Britain. The self-evident success of his methods eventually gave the nascent science of biomedical engineering ‘respectability’ leading to our today’s acceptance of heart surgery and knee and hip replacements as being routine. Another revelation was his being called–up to Army service, made an honorary major in the Royal Army Medical Corps and posted to Ghana, of all the unlikeliest places, in 1942. This put an end to his work on cataracts. (It has been suggested that this was the objective of a more senior surgeon who arranged the posting). However, it was there that this incredible man, with simple equipment, identified the cause of “River Disease” which had been blinding millions of Africans each year. To my surprised delight, I also learnt that he had been born on 10th July 1906 in Kibworth Beauchamp, Leicestershire. This was confirmed by a copy of his birth certificate but it took considerable detective work to find his actual address. Aided by Chris French, a third year ophthalmology student and the clever research work by George Weston of the Kibworth History Society, his home was eventually identified as The Gables. But, I was still flummoxed until Harcourt’s senior village-born resident, Miriam Hunt identified this as today’s Little Lebanon, 70, Leicester Road. With the enthusiastic approval of the Dougal Powrie, the property owner and his wife Alison, the way is at last open for his home village to honour him by affixing a blue plaque to his birthplace. His father Nicolas, a retired Royal Navy surgeon, was for some years the Consultant Ophthalmic surgeon to the Leicester Royal Infirmary. His mother, Margaret was a member of the wealthy family that invented the safety pin. She was also a close friend of Florence Nightingale and Harold often proudly boasted that he had been dandled on her knee when an infant. He had a sister and a younger brother. His brilliance as a surgeon was quickly established when he became a Fellow of the Royal College of Surgeons at the earliest possible age of twenty five. This is when he opted to follow his father by specialising on the eye and confronting cataracts, a major cause of blindness. One can only imagine his strength of character that enabled him to carry on with his work whilst ostracised by his profession. Fortunately for all of us, the North Americans recognised his pioneering work early on in the 1970’s which must have been of tremendous encouragement to him. At the end of the 1980s he himself had the lenses in both his eyes replaced. "I am the only man to have invented his own operation," he reflected. In his native land, formal recognition from his profession came only in 1986 when he was elected a Fellow of the Royal Society and, only just in the nick of time, with the award of a knighthood in February 2000. He died aged 94 in May 2001.